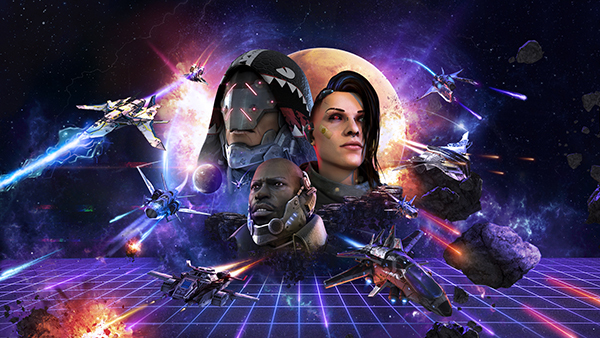 Phobos Vector Prime is a third person space shooter with an inmersive single player campaing and a wild action MOBA up to six online players. Well, we are working hard on the development of Phobos Vector Prime but we have found time to start a devlog serie with which we want to make you part of the creative process behind our project. We have dedicated this first video to introduce ourselves: we want you to meet us, to know who we are and what are our influences. We also explain where the name of our study comes from. There is still a lot of work to do, but we want to publish a devlog like this every now and then so you can see how the creation of Phobos Vector Prime advances. During the next months we will explain the curiosities and details about the game, stay tuned! If you do not want to lose anything you can follow us on Twitter, Facebook and Instagram, besides signing up for our newsletter. - The first is a GIF in which you can see a timelapse of how we built the city, one of the maps of the second main mission of our Story Mode. We use our own assets designed and modeled from scratch, and then assemble everything in Unity. That's all at the moment, it only remains to tell you that the development is progressing very well, that our Kickstarter is just around the corner and that we will soon announce the release date of Story Mode on PlayStation4! wow! Congratulations! The arts are amazing! Working on new cinematic environment, what do you think? Hi everyone! We are working very hard on the final touches of our Campaign Mode to launch it on PlayStation 4 at the beginning of 2018, but meanwhile we wanted to continue with our series of devlogs. In this video we show you the basic mechanics of Phobos Vector Prime, as well as its gameplay and the skills of each spaceship. Within the basic mechanics of Phobos Vector Prime one of the most important is the movement of the spaceshift (obviously), which is handled with the two joystick as in a twin-stick shooter but with the difference that in our game you can control the burst shot using the R1 button. Our intention is that the player can handle the ship with smoothness, but without losing precision both to dodge and to aim. We've recently incorporated a new mechanic that supposes an additional help to the basic movement; it is the dash, a small quick move that makes it easy to dodge shots, get in the combat and exit from it. 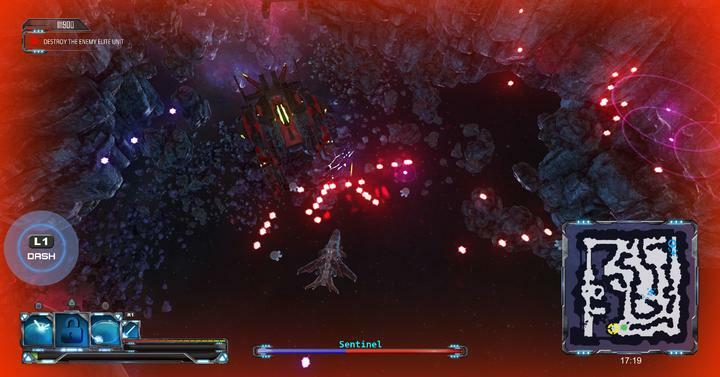 The use of the dash is unlimited, but it has a short waiting time that serves to prevent the player from overusing it. Dark Moth (Renegade): this model is aimed at resistance combat, that is, it behaves like a tank. It has skills like 'Battle Breath', which generates a force field that makes it invulnerable to damage for a limited time. In addition to that, Dark Moth has a power shield that causes impact damage and a powerful special ability that deploys a destructive wave capable of killing enemies in seconds. Eagle (Milician): his game system is similar to a DPS. Its first skill increases the rate of the basic shot, which allows it to hit twice as fast in the enemy defenses. But what really stands out from this spaceship is its ultimate; its name is 'Infernal Rain' and consists of a powerful attack in the shape of an open cone that raves at the enemies that are inside that area. Goose (Bounty Killer): these mercenaries have a fleet of space vehicles designed for tactical combat. Its skills oscillate between stealth and power, so the Goose can become invisible to enemies and deploy undetectable mines by the radars of adversaries, but at the same time it has a particle accelerator that allows pilots to generate lightning that goes through all those who put themselves ahead. In addition to using Integrated Combat Systems, players can expand their offensive through Tactical Personalization, a system that allows you to choose what type of drones you want to deploy. How does it work? 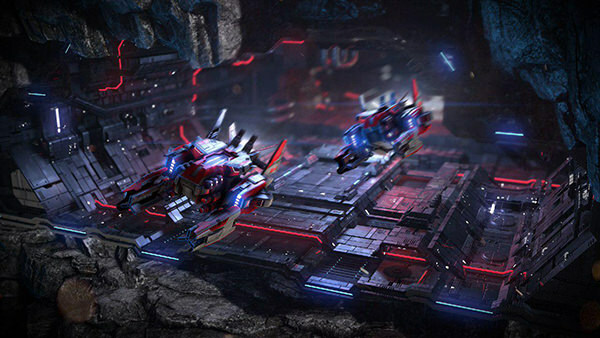 In each online game players can hack one of the many drone factories on the map and with the points they can decide what kind of drones they want to use in the next waves. There are many more skills and mechanics within Phobos Vector Prime: some of them are in the final version of the game, others are ideas that can only be realized with your support. Anyway, we hope you enjoyed this video, see you in the next devlog! Also we're working on some aditional feedback for the players, like sound effects and controller vibration. Do you recommend us include something more? or maybe as you play the game you can unlock different colours? It's a great idea! Actually, we have different types of ammo, but not only change the color but also the 3D model, the particle effects and the shooting speed ... I think we can implement some option so that the player unlocks different colors for his main shot, thanks for the advice! Right now we are working hard on the creation of a new trailer that I hope will not take long to publish. As soon as we have it, I'll post it here! Esto tiene una pinta estupenda, muchos ánimos! From now on we will be here in a more active way showing our progress and asking for feedback on the new ideas that we are going to implement in the game! First of all you may think in every detail that you want in the spaceship. Make a sketch on a paper (or wherever you feel comfy) by using basic geometric shapes. Also you may keep in mind that the design must have sense: if you’re drawing a resistant spaceship try to make it look strong. Decide in this step the kind of weapons/powers/defenses that you spaceship will have. It’s all about details. We aren't only talking about of the videogame’s aesthetic and the atmosphere, but also about its size, form, weapons, skills, special effects, textures, behavior and even its place on the game’s story. Our team works on the following way: the game designer thinks and design a spaceship, talks with the programer and decides what weapons and powers it may have, then they draws it on a paper and give it to the 2D artist, who design the vehicle’s concept art which will guide the modelling of the Low Poly Spaceship carried out by the 3D artist. Easy peasy. Actually before start the modelling process the team has to approve the spaceship’s concept. It has to be well adapted to the retro aesthetic of Phobos Vector Prime, that has an marked 80s style but with realistic/futuristic assets. When the concept gets approved, the modelling stage of the object starts. This process is so hard that it can last several days. Even weeks. In this step we use a vast bunch of software: Cinema 4D, ZBrush, UVLayout, Maya, X Normal, Quixel Suite, Substance Painter and, finally, Unity 3D. After finish the 3D model is important to unwrap the UV, i.e. export each polygon to a coordinates graphics. You can use UVLayout or Maya. Thanks to this technique we can divide the Low Poly Spaceship depending its materials textures. It’s also a way to facilitate our work for next steps. As we said, because the higher number of polygons the asset will be heavier. This can drive some performance problems, so you need to optimize the high poly before export it. This way we keep the model details saving polygon density. You can use various plugins for this purpose, but we recommend Decimation Master. To continue with the process it’s necessary to export both models (High Poly and Low Poly) to X Normal. Here we baking in the model, i.e. overturning the high poly model information in the Low Poly Spaceship like if you were putting stickers. So you have a realistic and detailed spaceship but with a low number of polygons. Then we have to extract channels of the object that mean each different property of the object material. In this case: Normal, Ambient Occlusion, Bent Normal, Height and Curvature. Every channel is a map with an expecifict applications. The most important is the Normal Map. We use it to keep the details of the high-poly model in our spaceship low-poly. first. Finally, the last step of the modeling process of our Low Poly Spaceship is over. It's time to integrate the asset in the graphic motor, in our case is Unity 3D. Here we need to import every information, from textures to any Quixel object, determining how to will be in the final game. This may be a hard process so we’ll explain it in followings dev blogs.